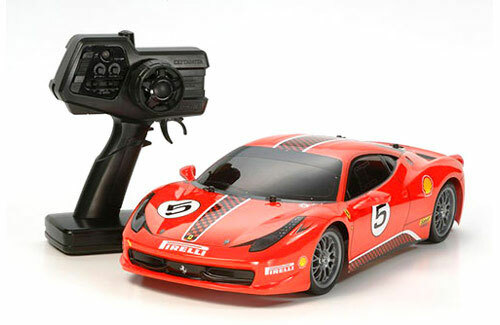 All Products > "46623 Tamiya 1/10 XB Ferrari 458 (TT-01)"
Tamiya have proudly released a Ready-to-Run Expert Built radio controlled model of the Ferrari 458 Challenge racing car based on the proven & beginner friendly TT-01 chassis which can be easily hopped up to improve performance. The kit has been built by Tamiya so quality is assured. This is a Read-to-Run expert built radio control model of the Ferrari 458 Challenge race car. The kit has been built by Tamiya's expert builders (XB) to ensure the beginning R/C enthusiast receives a high quality built car so they may enjoy driving it right out of the box.